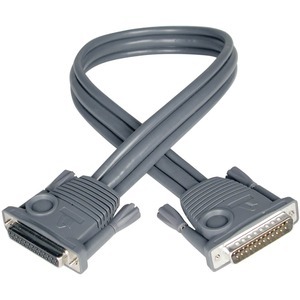 Tripp Lite's 15-ft. daisy chain cable is designed to connect a B022-016 NetDirector KVM switch to another NetDirector KVM switch, allowing for the expansion of the number of computers/servers that can be controlled from a single keyboard, mouse and monitor. This premium cable features a PVC jacket and double shielding (foil and braid) for maximum EMI/RFI protection. The cable's DB25 connectors are molded with integral strain relief and easy-grip textured overmold. Tripp Lite warrants this product to be free from defects in materials and workmanship for life.